Winners must email Sue at sue@suebleiweiss.com with their full name, flickr name and mailing address by 8/9/12 in order to claim their prize. Winners must email Sue at sue@suebleiweiss.com with their full name, flickr name and mailing address by 8/9/12 in order to claim their prize. Prizes not claimed by 8/9/12 are forfeited. 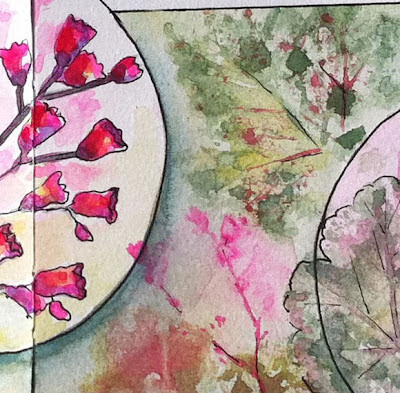 The Sketchbook Challenge Workshops and More! 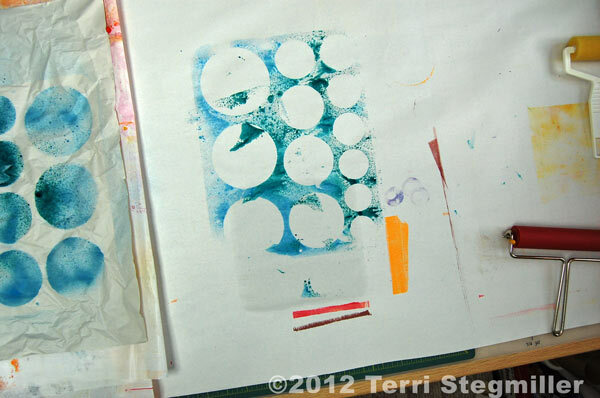 Sue Bleiweiss will be teaching a Mixed Media sketchbook surfaces workshop. 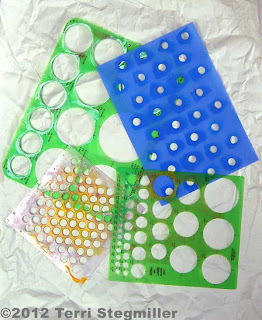 In this workshop you'll spend the day immersed in experimenting with screen printing, stenciling and leaf printing plus you'll learn how to add additional imagery to your papers by writing with a paint filled craft syringe. By the end of the day you'll have learned some new techniques to use when you work in your sketchbooks and you'll have a stash of gorgeous papers to incorporate into your sketchbook pages and collages. Call Ink About It at 978-392-0321 to register for this class. July 30 - August 7th Art Unraveled 2012 From 'Puzzling Portraits' to carving lino blocks and turning them into mixed media art journal pages in 'A Cut Above' the 10th anniversary of Art Unraveled promises to be an exciting time! 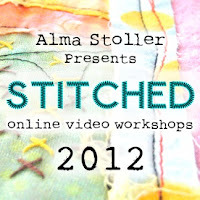 I hope you'll consider joining me for one of my workshops in Phoenix, AZ this summer. If you want to check out more of my lino cuts you can see them in the May issue of Somerset Studio. Also be on the lookout for my new line of stamps inspired by that article in the Shoppe at Stampington this July! More info here. I'll be wearing my tutu (cobalt teal of course) will you? If you are attending Art Is in October I hope you'll consider joining me for one of my workshops. 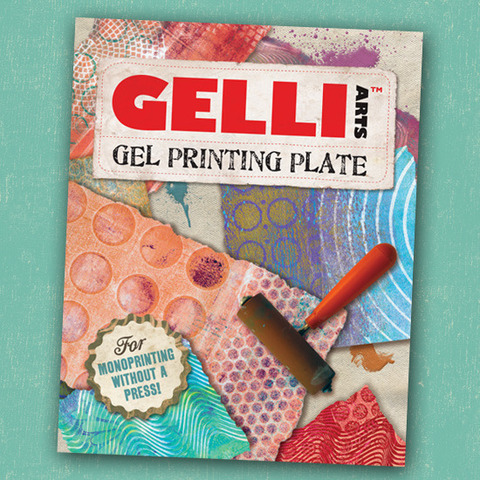 We'll explore mixed media that includes using my new line of Liquid Pencil Sketching Inks and Mixed Media Adhesive to create collaged works of art. Afraid of creating a self portrait? Well fear no more as we explore journaling, painting and learn how to shade a face on a 3D bust creating a perfect piece to display in your studio. More info here. 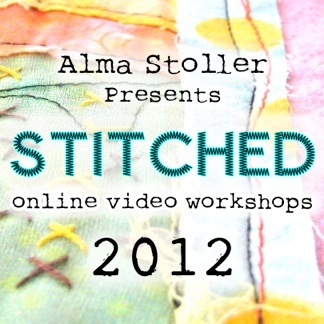 Deborah Boschert is an instructor with STITCHED, a collection of 20 online video workshops. Her workshop is titled Branches, Buds and Blossoms: A Botanical Fabric collage and includes segments on surface design, composition and embellishment. More info here. Deborah Boschert's new DVD workshop from Quilting Arts was just released! "Contemporary Fabric Collage: Design, Stitch and Finish" includes segments on fabric selection, using sheer fabrics and hand embroidery. More info here. Sign up for Deborah Boschert's e-newsletter for regular updates and free pdf downloads. Come play at the biggest and best quilt conference you've ever seen. Classes with Lyric include Surface Design, Creative Collage, Abstract-A-Licious, and Just Foiling Around! More info here. Start your planning for next spring! Five fabulous days playing with fabric, paint, foil, photo transfer, beading, stamping, screen printing - and a little design too! More info here. June 26 - July 2, 2013 Becoming an Artist in Italy! The beauty of the Italian countryside is is a glorious setting for awakening your creative abilities and nurturing your desire to become an artist. More info here. 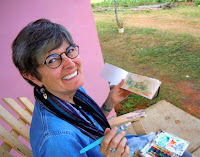 Jane Davies will be teaching at Random Arts in Saluda, NC on September 7, 8 and 9. See details here. Hi again, its Desiree! 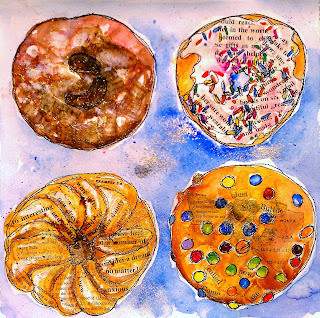 I love this theme, circles, they are everywhere as we are seeing here on the Sketchbook challenge and all of the wonderful things I see happening on the Flickr site! I wanted to share another one of my monthly sketching classes with you. We worked with circles in our sketchbooks to add an importance to our sketch, almost like a magnifying glass! I had everyone go into my garden and pick something that inspired them. I would of loved to have you join us! Everyone choose something different, from leaves to flowers etc. I then had them do a double page spread and make three circles. One for text, one for a sketch of their flower or leaves and one for a magnified view of a part of their plant. 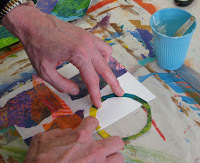 I encouraged them to allow the circles to fall off the page and we taped off the edges before we painted. 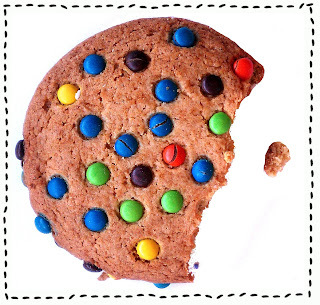 I also talked about color and they each had to choose only three colors, a blue, a yellow and a red. That is what you see in the upper left hand side of the sketchbook page. We painted soft backgrounds, did mono printing with our leaves and painted our flowers. 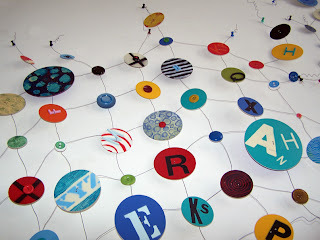 Circles are a wonderful way to give special attention to something! 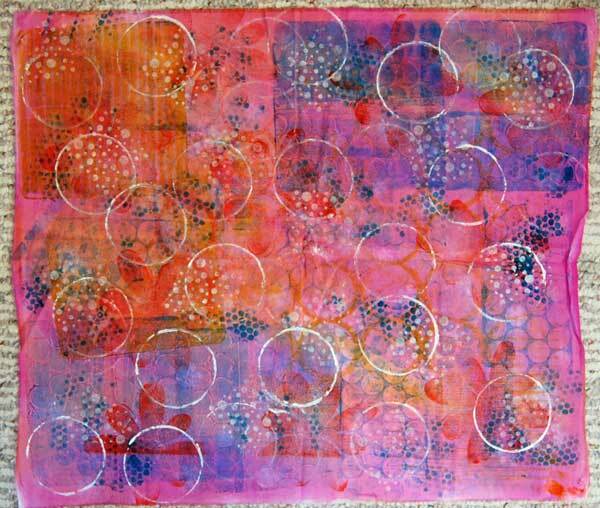 Did you notice that I added a shadow behind a few of the circles that make them appear to float on the page, you can do that very easily by darkening only one side of your circle. There is a video available on my website of the complete lesson. 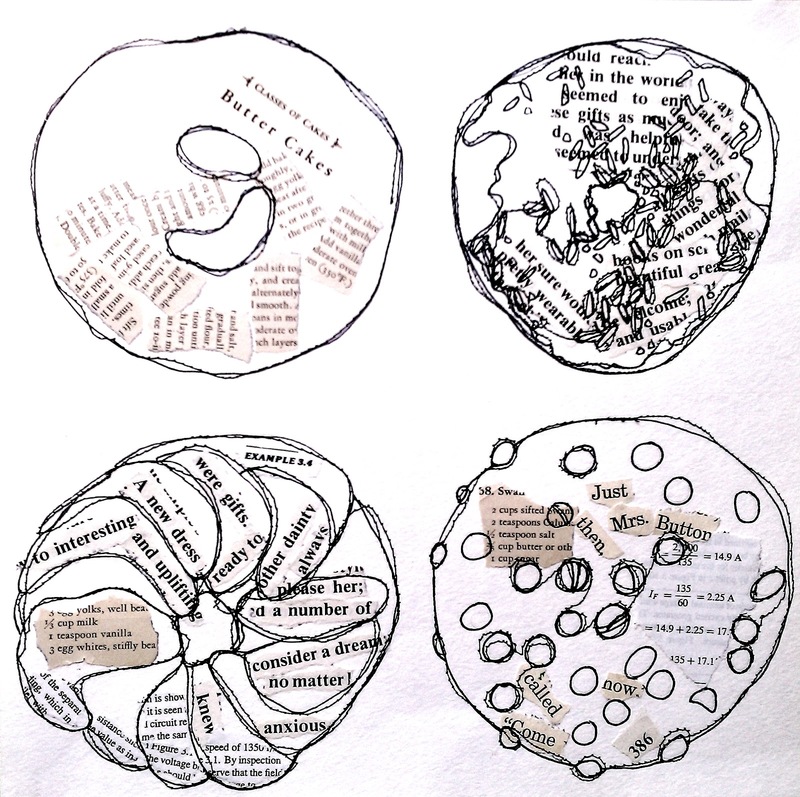 Here is another day when I was sketching and used a circle to make something on my page stand out or more special. 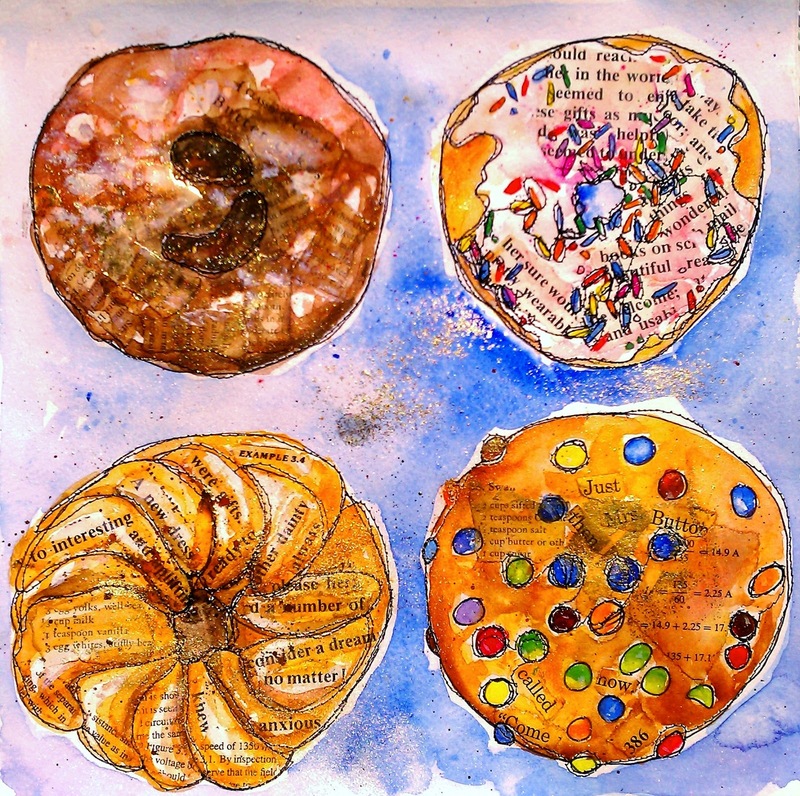 I hope you enjoy making circles surround those special things in your sketchbooks too! 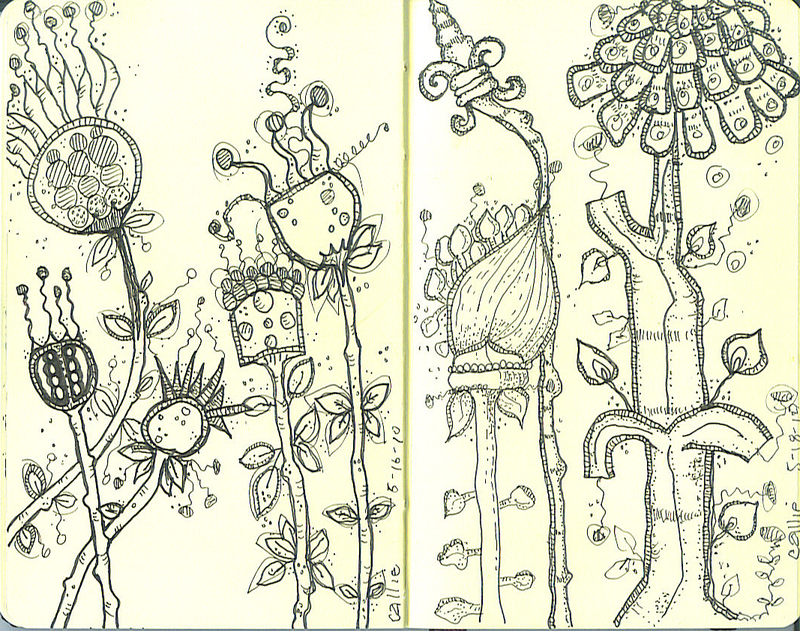 I wanted to show you a couple of sketchbook pages of mine from a couple of years ago that contain many, many circles. We could play the "how many circles can YOU find?" with any of these pages. So...how many circles DID you find? Leslie here. I've been in California since 7/15: I flew to Oakland where I met a close friend and we set out in a rented car to repeat a road trip we took together 25 years ago. We drove to Mendocino and eventually headed south on the Pacific Coast Highway toward Los Angeles, where we co-hosted a baby shower. Since I see circles everywhere, I decided to photograph a "few" that I observed along the way. 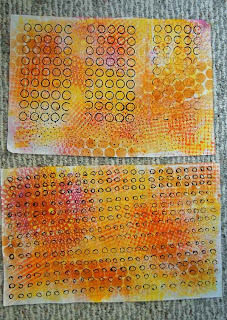 These are pretty weird, but I decided to put them in anyway because I love that you can spot circles almost anywhere, anytime. I'm obsessed with the Los Angeles Athletic Club logo. I stayed here for 3 nights and it was great! Shower take-home goodies: jars of Meyer Lemon marmalade with my screenprinted lemons on the tea towels! Jamie Fingal checking in on 'circles.' This was so fun to paint with watercolors. 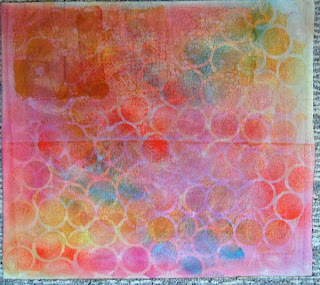 I painted the background first, then kept adding the circles on two different pieces of paper. One I left whole, and the other was cut out to make the flowers. It's sort of an illusion from this distance, but you can click on the photo and see it larger. This one was made with a painted background in light colors, then I cut up Washi paper in different geometric shapes, and pieces of text from a magazine, paper towels and used matte medium to decoupage them onto the paper. I love the layers of paint and paper. And if you didn't know it, you would think the entire piece was painted. I enhanced the circles with more paint to create movement. I learned this technique in a class I took last year from artist, Gerald Brommer. Jane Davies here. 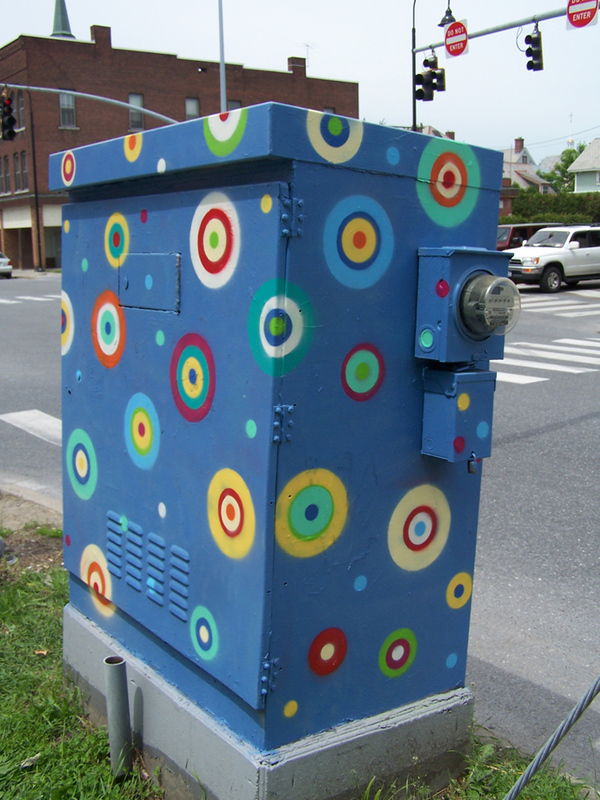 I want to show you the work of another Vermont artist, Janet Van Fleet. 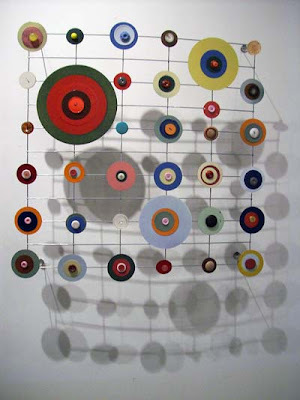 She has been working with circles for a very long time, and I was lucky enough to meet her recently at a gallery opening. I'd seen her work at Studio Place Arts, where I teach occasionally, and where she is a founding member and has her studio. 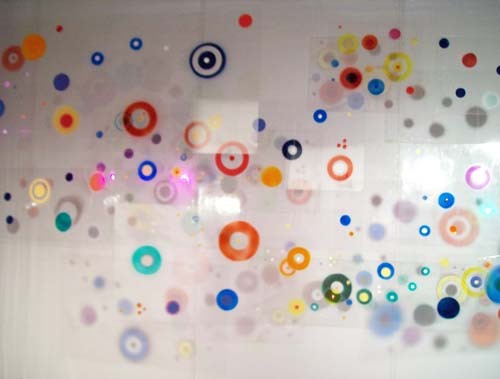 What do circles mean to you? I have said in a statement about my "Circular Statements" body of work that circles "suggest to me individual units of being or matter, like motes in the sunlight. They represent, both formally and symbolically, all the different orders of magnitude, from sub-atomic particles through suns and galaxies." How did you come to use this format in your artwork? I started making paintings of eggs, and later when I began to work with circles, I thought perhaps there was a connection with the previous shapes. 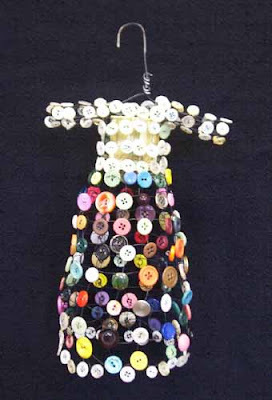 The buttons just sort of popped out at me as a wonderful material -- they are like little jewels, they are connectors that attach one thing to another, and they are worn next to people's bodies, which seems intimate and of a nice, human scale. The front of a button is called the "face." 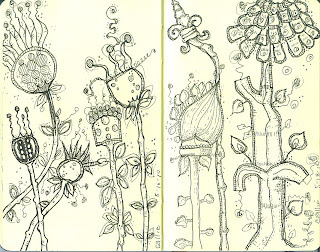 Janet does not use a sketchbook as such, but does sketch things out on paper. I hope that does not violate the sensibility or purpose of this blog to post her work here; I just thought you'd like to see an artist who takes circles SERIOUSLY!! Hi everyone! Terri here. Over the course of the past year, I happened upon a product that I have come to love using in my work. The product is Tumble Dyes by SEI. There are lots of colors to choose from and they are marketed toward the fabric/textile user. BUT....I use them on paper too. 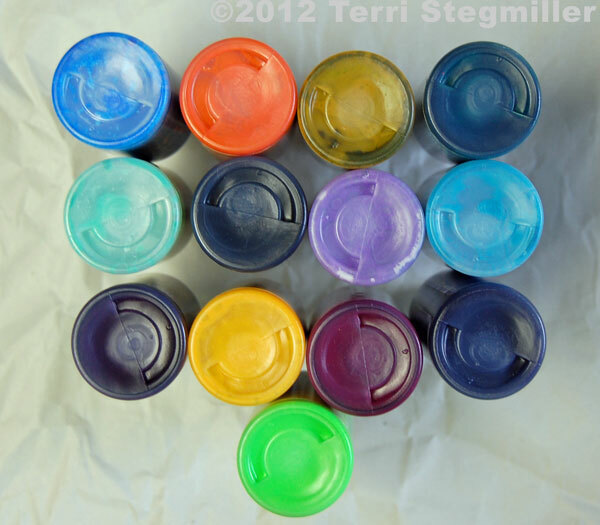 The one thing that I love about these spray-on colors is they are permanent, unlike some of the other leading brand spray-on colors. I find when I use spray-on color in my art journal or sketchbook, the versions that are not permanent or waterproof will reactivate when I apply other wet media over the top and then my colors are all mixing up and sometimes that is just not desired. So this product really works well for alleviating that problem. Here's a technique that I use both in my journals, papers and fabric projects. First, I get out my stencils. 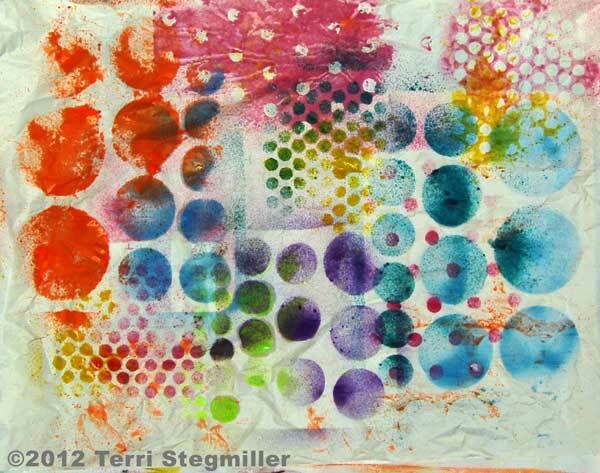 I like using several stencils at one time. 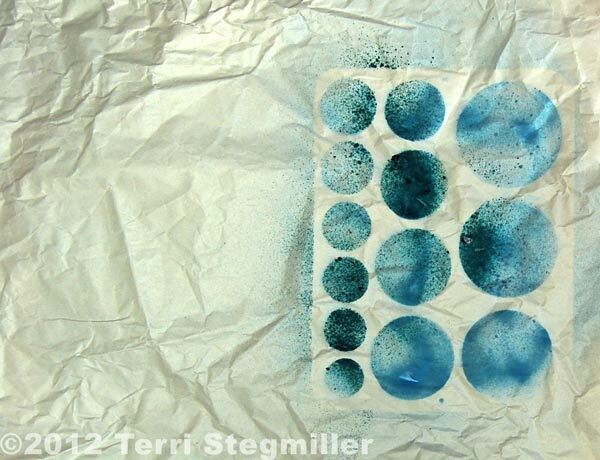 I'm working on a piece of paper that was used as packing paper in a package I received. 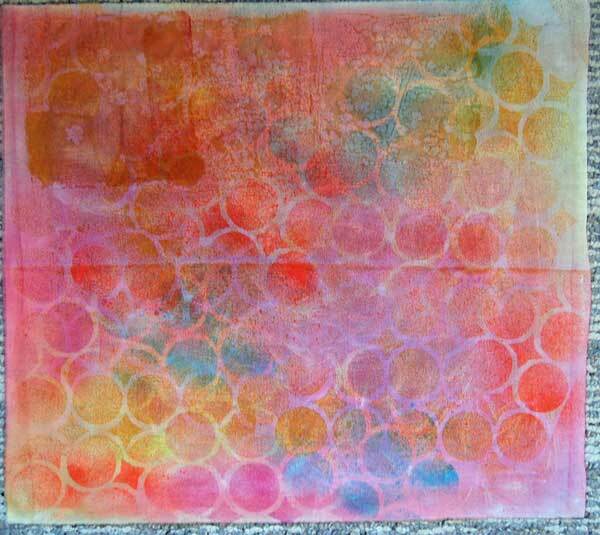 I always save this paper because it works so well for experimenting and I also repurpose it and use it as collage paper or gift wrap paper. Start by spritzing some Tumble Dye color over the top of one of the stencils. Next I will flip the stencil over and press it down either on the piece I'm working on or another piece of fabric or paper next to me. 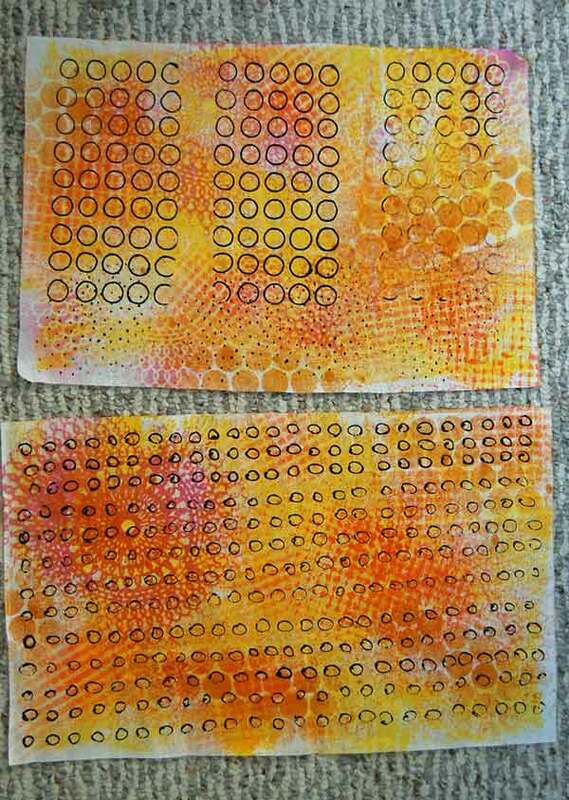 The excess color that was on the stencil creates a negative image and these look great too. Keep spritzing and adding more stencil designs and color to your project and pretty soon you have some very interesting designs and layers started. 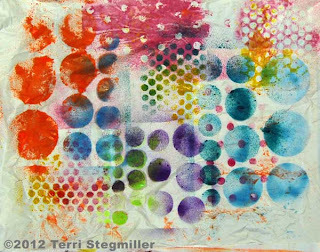 I like to use these colorful stenciled layers as the starting point for sketchbook pages, paintings and quilt projects. 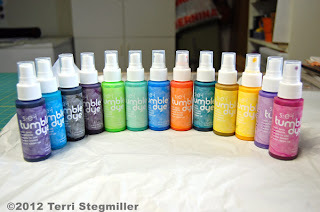 I found my Tumble Dyes at my local Hobby Lobby and I've also seen them at various retail locations online. 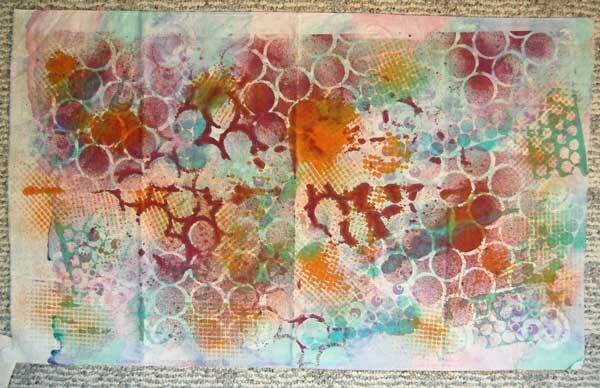 Here are some other samples of fabrics that I've made with circles as a theme. 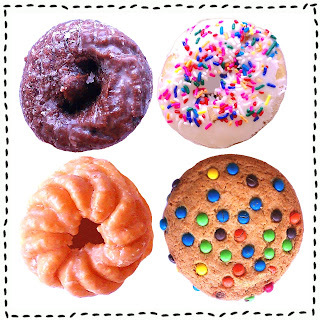 Circular Sweets...All Things Round are Delicious! Kelli here. Circular sweets are my favorite kind. I began my research with a variety of doughnuts and big polka dot cookies, but I could have included frosted cakes and mile high pies. Below you see the round suspects I gathered up for the good of the cause. 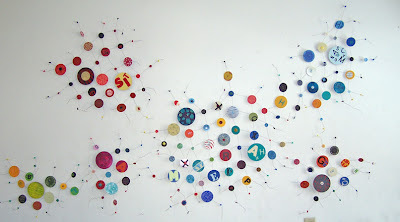 They were duly sketched, collaged and threadsketched with black thread. Watercolors came next. 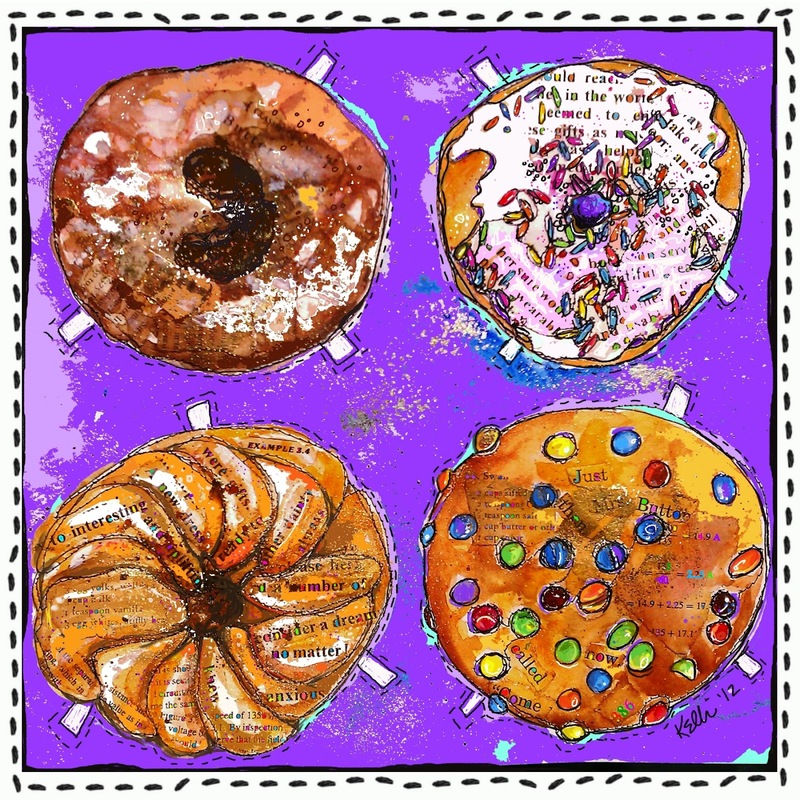 It's surprising how many shades of toasty brown you can blend up, from chestnut and mocha for the chocolate doughnut, to lemony brown sugar shades for the cookie. I added a sprinkle of tri-color gold powder for a smidge of glitz. This watercolor sketchbook page was photographed and then I edited it in paint.net and also Corel Painter 12 to arrive at the image at the beginning of this post. 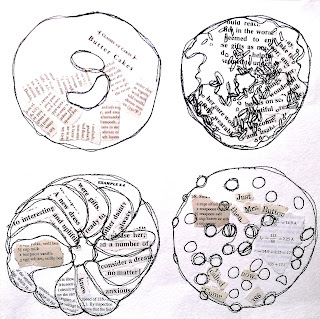 See the fuller expose of my circular sketching on my blog: ephemeralalchemy. And of course, all's well that ends well. The only way to dispose of the pesky circles...down the hatch!